The Department of Labor has ordered Wells Fargo to rehire a whistleblower the bank fired in 2010 after he reported suspected fraud -- and to cough up $5.4 million. "The manager, who had previously received positive job performance appraisals, was abruptly dismissed from his position at a Wells Fargo branch in the Los Angeles area after he reported separate incidents of suspected bank, mail and wire fraud by two bankers under his supervision," the Occupational Safety and Health Administration said in a statement Monday. OSHA, a part of the Labor Department, demanded that Wells Fargo (WFC) give the manager his job back and pay him $5.4 million in back pay, damages and attorneys' fees. The agency said an investigation concluded that the manager's whistleblowing contributed to his dismissal, in violation of the law. He had flagged suspected fraud to his superiors and via an ethics hotline, and hasn't been able to find work in the banking industry since he was fired. Wells Fargo said it doesn't agree with the assessment. "This decision is a preliminary order and to date there has been no hearing on the merits of this case," spokesman Vince Scanlon said in a statement. "We disagree with the findings and will be requesting a full hearing of the matter." OSHA said the bank can challenge the finding to an administrative law judge but must still comply with the order. 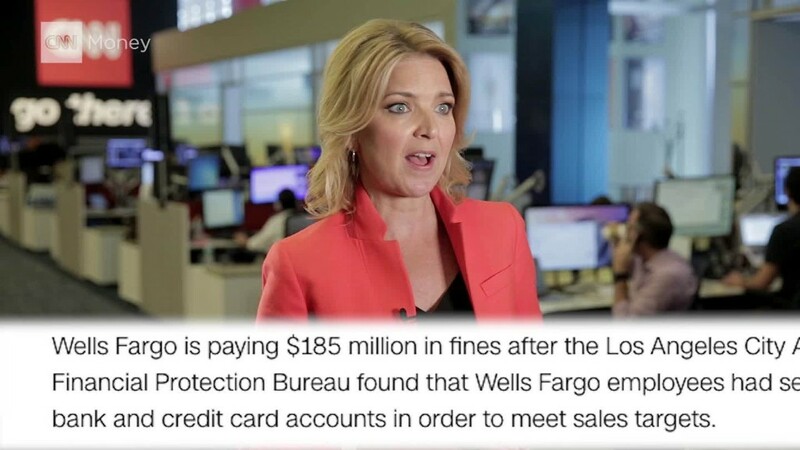 In the past year, Wells Fargo has come under fire for illegal sales practices. The company admitted to creating as many as 2 million fake accounts between 2011 and 2015 and has since paid $185 million in penalties and apologized. Almost half a dozen workers told CNNMoney in September that they were fired for flagging malfeasance. Alleged retaliation was a sticking point for members of Congress, who grilled former CEO John Stumpf on the issue at a hearing last September. Wells Fargo said in January that it found evidence that at least some of these whistleblower retaliation claims published by CNNMoney and other outlets may have merit. The bank's new CEO, Tim Sloan, said Wells Fargo reviewed all reports made by whistleblowers over the past five years in which callers identified themselves and hired a third party to look into cases where employees were terminated within 12 months of calling. OSHA said it could not say whether the fraudulent activity that the manager reported was related to the creation of fake accounts because that information is outside the scope of their investigation. The Department of Labor announced last year it would review both open and closed whistleblower complaints against Wells Fargo.